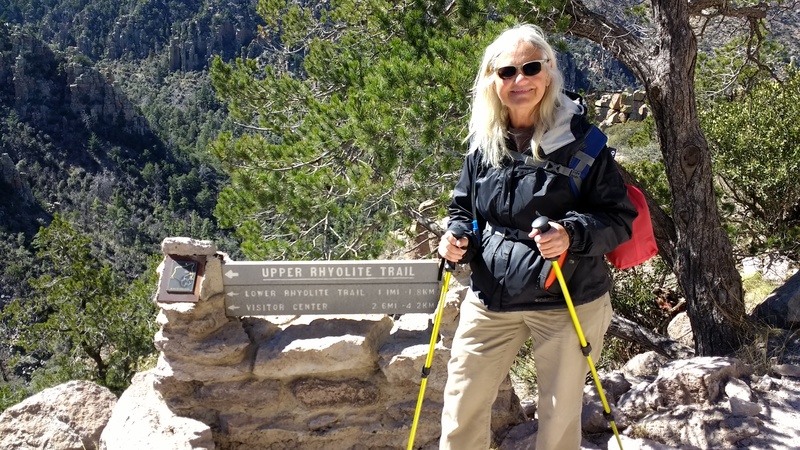 ← Touring the Queen Mine in Bisbee Arizona! 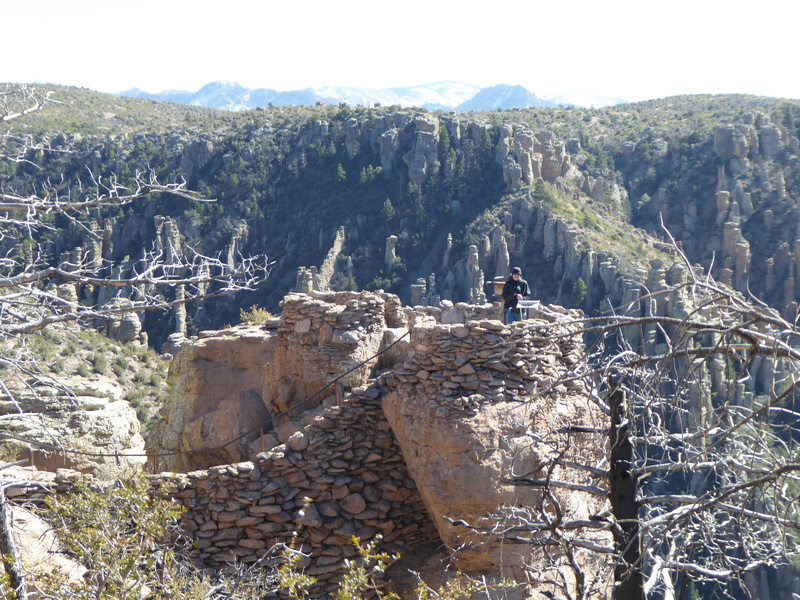 We departed Bisbee and headed to Chiricahua National Monument. 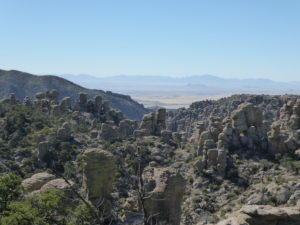 Chiricahua is an isolated mountain range rising above the surrounding grassland sea. 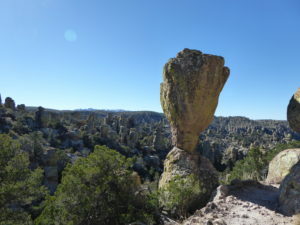 The mountain ranges are different though in that there are rock pinnacles that stand up tall with various shapes. It is unlike anything we have seen before. 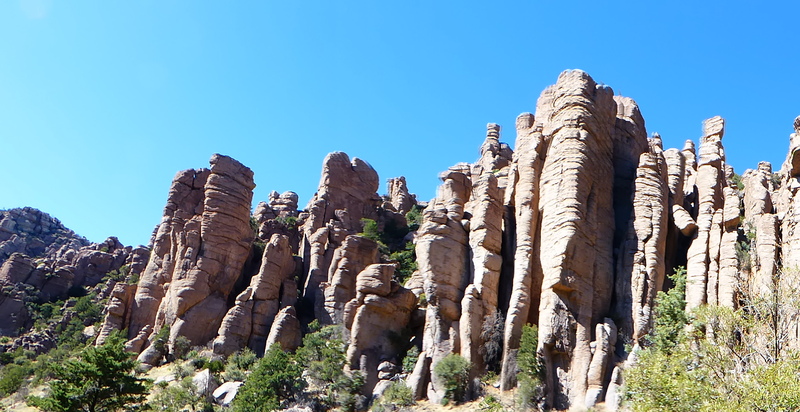 The Chiricahua Apache called the pinnacles “standing up rocks”. The rock formation below is called Organ Pipe. The park is absolutely stunning with over 85% of its 13,000 acres designated as wilderness. We lucked out and got a campsite even though the sign said campsite full! We drove the eight mile scenic drive from the grasslands to the summit at Massai Point. We hiked a trail there from Echo Point. The wind was ferocious and it was hard to stay warm! The next day we had signed up for a van ride from the campground to the top of Echo Point so we could hike back to the campground. 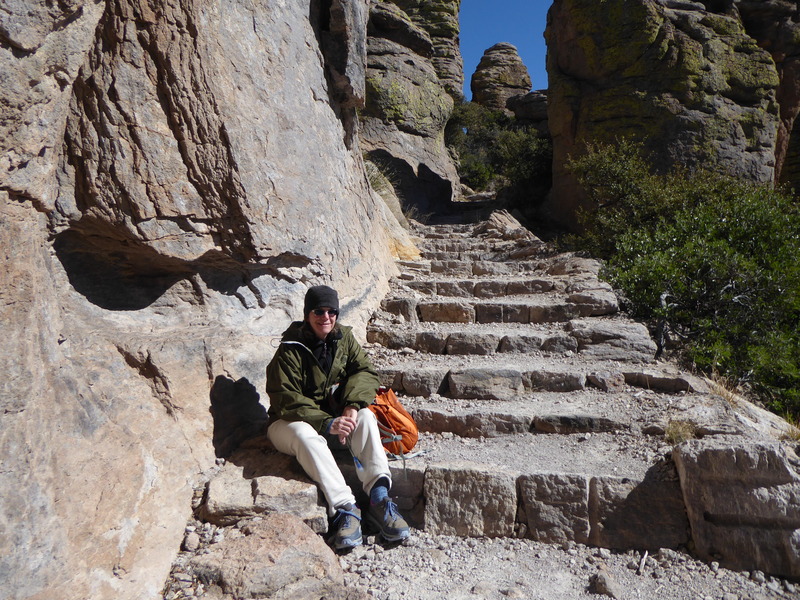 The hike was down Echo Canyon and the upper and lower Rhyolite Trails for a total of 4.7 miles. It was very rocky at the beginning of the trail and was pretty much downhill the entire trip, which is hard going on the joints. The new hiking poles helped tremendously. The trail was built by the Civilian Conservation Corps. 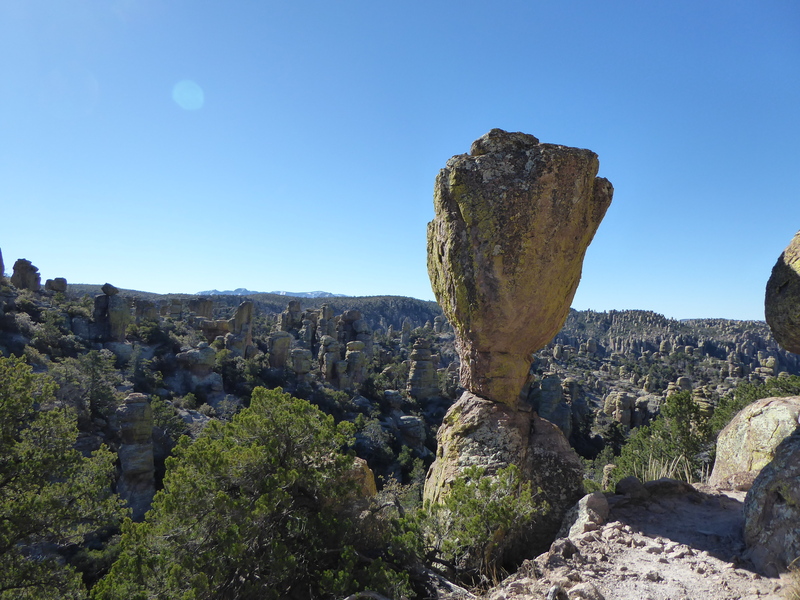 It was designed to go through, in and around the most interesting rock formations. 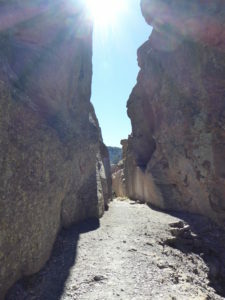 The original trail was used primarily by horseback. Horses are still allowed on the trail today and we saw evidence of that. Here is a lookout tower at the top of Massai Point that was built by the CCC. This was the longest set of man-made steps on the trail and we stopped for a snack. Hiking the trails gives you an appreciation of the skill and effort of the young men who built these trails. There was a long natural slit in the rocks that the trail was designed to go through. 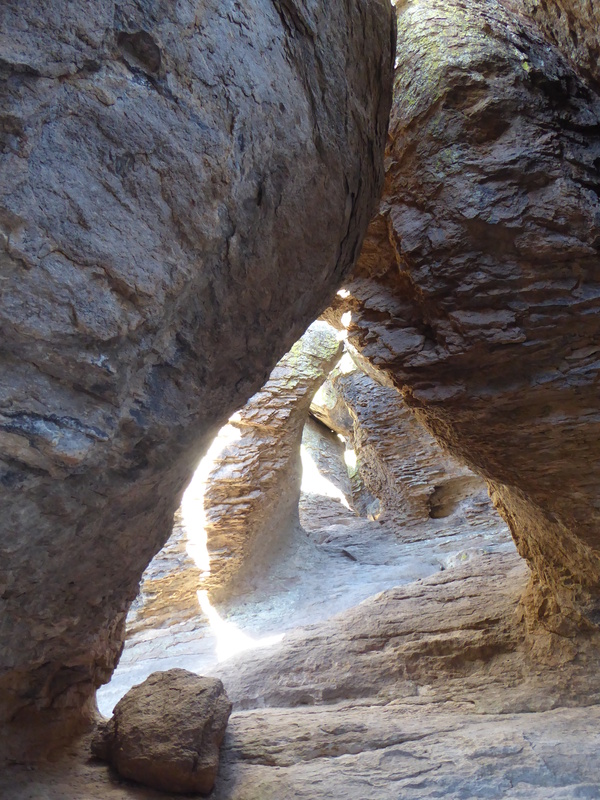 This section of rocks feels likes caves when you hike through it. 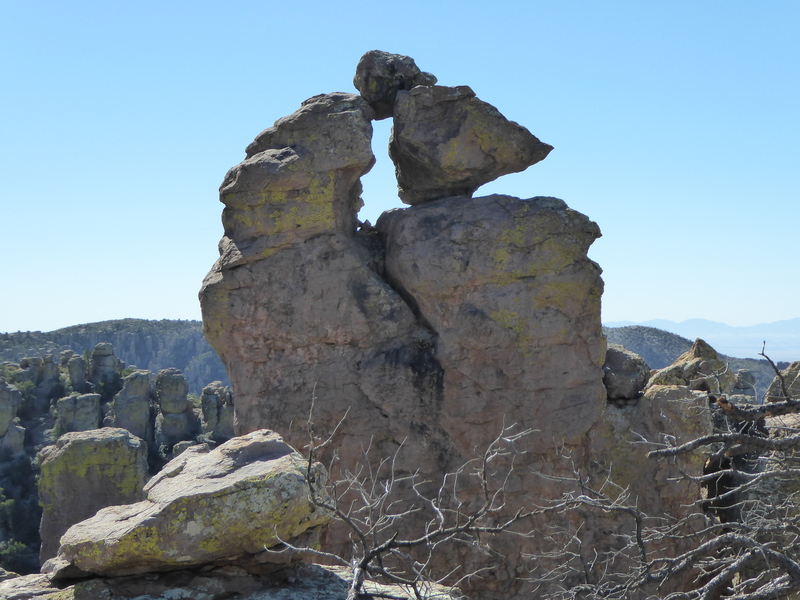 It is actually rocks on top of rocks and is called The Grottoes. 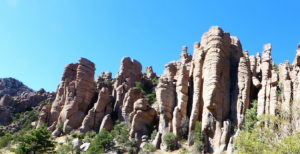 We did see some beautiful rock formations and had a nice time. It was windy and cold. We had to wear quite a few layers. 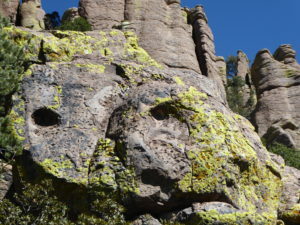 The yellow lichen makes this rock formation look like something out of a scary movie! The next morning was the coldest yet on the trip. We woke to the camper being 41 degrees inside and 26 degrees outside! BRRR! We came west to get away from this stuff! The campground was at about 5400 feet so we were at a high elevation. We started our hike at Echo Canyon at 6780 ft. We used our Little Buddy heater and got it warm enough to be comfortable until we could turn on the generator at 8am. 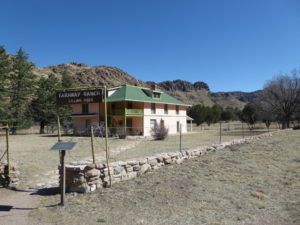 We toured the Faraway Ranch in the park at Bonita Canyon. Our tour guide was a park volunteer who was 81 and was quite enthusiastic about the history of the ranch. The owners of the ranch were Swedish immigrants and their oldest daughter Lillian and her husband built the homestead into a guest ranch. Lillian lobbied hard for the protection of the area and was instrumental in making this area into a park. 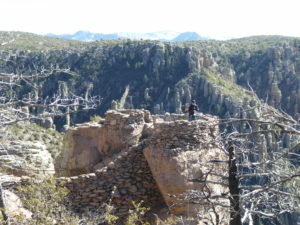 This entry was posted in Arizona and tagged Chiricahua, Faraway Ranch. Bookmark the permalink. Someday…I think we will use your Blog as our travel guide!!! 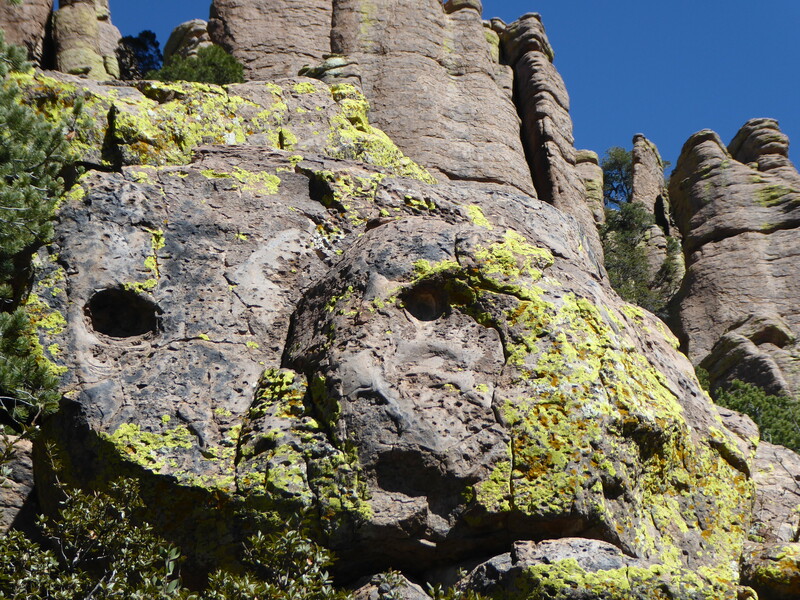 What an interesting park and the photos from your hike are stunning. You will be thankful you are missing the snowstorm tonight!! !